Delivery is available throughout the 50 U.S states and Canada Monday through Saturday (except legal holidays) in all areas served by local florists, with same-day delivery normally available on orders received by 1:00 pm weekdays, and 12:00 noon Saturdays in the recipient's time zone (excluding peak floral periods). Otherwise, next-day delivery is the norm. At peak floral periods, such as Christmas, Valentine's, and Mother's Day weeks, please order at least one day in advance. If you are ordering at least 24 hours in advance, you may request morning delivery, afternoon delivery, or delivery by a specific afternoon time. 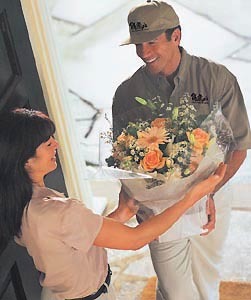 For same-day deliveries placed by 12:00 noon (recipient's time zone), you may also request delivery by 5:00 pm. While the time of delivery can not be guaranteed (especially during peak floral periods), we are happy and able to honor most such requests at non-peak periods.